The much anticipated Passo del San Gottardo will be relegated to the few Alp's passes on our "B" list. Like the views from the nearby funicular at Ritom, the views from San Gottardo weren't stunning. Certainly nice, but they didn't have us snapping endless photos with our camera or our minds. The mostly cobbled surface on the road was a terrible disappointment as cobbles aren't fun at any speed. Going up the usually 7-8% and sometimes 10% grades, often into a head wind, was hard enough without the energy-sapping rough road surface. We are accustomed to creeping along at 3 mph on steep slopes, but the cobbles dropped our speed even lower. From the top of Passo del San Gottardo: looking back down at our old road on the left & the freeway tunnel on the right. Another disappointment, like at Ritom, was the industrial overlay on the pass. Once at the top I was anxious to photo some grand panoramas but everywhere I turned my view was marred by high tension wires or massive towers. On our descent we spotted the dam that was likely generating the power being transmitted down both ravines. Yes, we were out in nature and in the high mountains, but there was a lot of concrete and metal that we normally don't have to filter out of our views. From below: our old road snakes up the right side..
One pleasant surprise on the route was all of the bikes on the old road. Motorcycles were the most common machines, with bikes coming in second and cars were third. It was nice having the 4-wheel traffic at such a low level and the "moto's" weren't in big packs, which can be nerve wracking to have passing us on steep slopes. 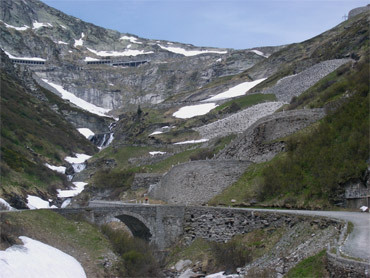 San Gottardo is one of the few passes on the Swiss network of national bike routes and is an obvious choice for crossing into Germany. We were surprised however at the flat affect of most of the riders. Few returned our greetings and no one lingered to chat, even at the top. We hadn't found the Swiss to be particularly friendly, either in their homeland or as tourists, so wondered if most of the riders were Swiss. We joke that when trying to engage a Swiss in conversation we often feel like we've asked them to divulge national secrets, as when at the top of the unmarked pass I inquired if it indeed was the top. In contrast, the clerk at the pass museum was happy to answer all of our questions, though she was from the much friendlier "Little Italy" side of Switzerland. Our traverse of San Gottard Pass ended in Andermatt as planned, the same ski resort village we laid-over in after the much more difficult crossing of Furka Pass in the rain last year. We made a beeline for the very comfy hotel we stayed in before and then hiked up the face of one of the steep slopes the next day--something we hadn't done in 2005. The big quandary to confront while in Andermatt was where to go next. 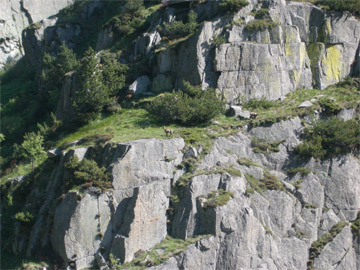 The steep walls of the difficult ravine route below Andermatt. We had arrived in Andermatt with a clear plan of heading back over the Alps into Italy via Splügen Pass--a pass we had biked over in the opposite direction in 2001. That would keep the loop through Switzerland short to minimize the sting of the high prices. But continuing down the valley from Andermatt and then taking 5 days to loop back to Italy had loomed as a new possibility. At the top of San Gottardo we had visited a little museum that explained that the really hard part of crossing the Alps at this pass was the terrain below Andermatt and not the actual pass. The Devil's Bridge was a part of the rich history, so named in the 13th century as many believed that the awesome (for the times) bridge could only have been built by the devil. By continuing down the valley, we could see the challenges of this area from the much easier downhill perspective rather than fully experiencing it another time by biking up it. But there was a hitch: the tumbling down of a couple of huge boulders that had killed 2 German tourists in their car several weeks earlier had resulted in both the freeway and our old road being closed. 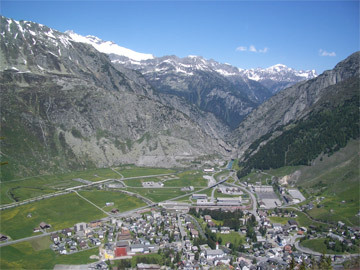 Andermatt: the ravine route exits at the pinched end of the valley. We'd heard about the road closure the day we arrived in Switzerland, which is why we changed our original plans and came to San Gottardo. The closure of the road north of Andermatt was drastically reducing the number of travelers into the general region, making it the perfect time for us as cyclists. We had planned on looping back south over Splügen before encountering the rockslide area but it was more intriguing as we got closer to it. Unraveling the truth about the roads had been difficult. 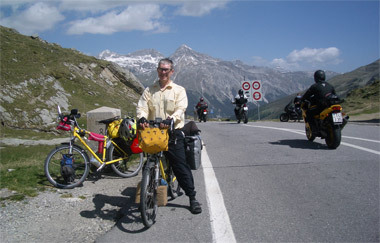 Among other things, we'd heard the road ahead of us was entirely closed; that it was closed to everyone except those with cars licensed in the 2 affected cantons; that the police would allow locals and surely bikes through; and that a receipt from an Andermatt hotel would in effect be a 'transit visa'. Once in the area, we realized that our confusion had been amplified by not understanding that on the south side of the pass there were 3 roads and on the north side there were only 2. We finally decided to scrap the Splügen Pass plan and hope for the best in getting through the rockslide area as we examined the challenges terrain of the old trade route. But once underway, we were immediately disappointed as the much-hyped modern version of the Devil's Bridge didn't even warrant a photo--it didn't convincingly reflect the uniqueness of the original structure. However, we did get off our bikes a number of times as we coasted down the very steep, shoulderless road to ponder the plight of those leading pack animals through this very narrow and boulder-strewn ravine. Of course, the original route was the best and so our road, the freeway and the railroad were crisscrossing the ancient track in this, the most constricted and rugged portion of the route. Up is the only other way out of Andermatt. We were so glad we weren't biking up the steep road because even with 'closed road' traffic volume, it would have been dicey. The road was very narrow and the many trucks on it took the full lane much of the time. The police didn't seem to be screening the traffic that got through, though we felt lucky to only have an 8 minute wait at the actual fatal slide site--our Andermatt hotelier had said it could be 2 hours. We could look up the steep mountain face and see the clouds of dust from the crews working to remove future hazards and could hear some rocks tumbling down, though only about 2/3's of the way to our elevation. I was very curious to go by the area where the tourists were killed, though not driven by morbid curiosity to "see the spot where....". Instead, I wanted to see if the casual traveler had a chance of knowing it was a dangerous area by looking at it. Every year we bike by too many slopes that look like accidents waiting to happen and I wondered if this was one of them. I was horrified to discover that the slide area in no way looked like a precarious situation. A few huge boulders had bounced down a perhaps 1000' high slope that was a much shallower grade than many we cruise by and presumably bounced over the adjacent and higher freeway to land on the old road near the river. It was an unnerving reality lesson to see just how unexpected the fatal situation had been. The high peaks, flat valley floors, and the steep slopes between them still dictate life in the mountainous regions. It was easy to see that rock falls, avalanches, landslides, flooding rivers, and isolation were necessary results of the extreme terrain. Also easy to see were the still-practiced, traditional mountain region occupations: processing timber, quarrying rock, growing hay, and tending dairy cows. As before when we were in Switzerland, it seemed that every mountain village had a small lumber mill, almost cottage industry-sized. And often the small mill would be feeding a couple of even smaller woodworking shops scattered on the backstreets of the village, usually attached to a home. The whirl of saw blades and the smell of sawdust were common sensory experiences as we cruised through Swiss mountain villages. 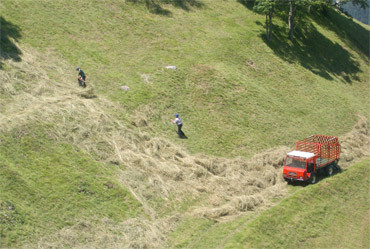 Cutting hay the easy way on the ridiculously steep slopes. Unlike the lumber mills, rock quarries are something we can often identify miles away by the characteristic scarring of the landscape and so they are an interesting industry for us to watch for. We can go months without seeing one, but in southern Switzerland small local quarries were an almost daily sight and sound. It's unusual to see so many small quarries peppering a valley wall and we wondered whether it was a difference in the rock or the politics that resulted in numerous small operations instead of a single large one. We again marveled at another small-scale industry and one that looked to us as absurd: the extensive hay growing in the mountainous regions of northern Italy, Switzerland, and Austria. The slopes were incredibly steep, with hay often being cut in near-vertical fields. It looked preposterously dangerous for something of such low value. We'd see more people cutting hay by hand with a huge scythe which they sharpen frequently with a whetstone pocketed on their belt than we did operating a walk-behind power cutter, though both were common sights. The economics of hay growing and processing intrigues us. Is it subsidized by the government? Is it continued because it's a fine old tradition and they just can't not do it? Is there a perceived quality difference in the home-grown product? The hours and hours we saw spent in the hot sun by people laboriously cutting and then repeatedly fluffing the hay as it dried were immense. It's incomprehensible that it is cost effective compared with growing hay on flat land and cutting it with a huge tractor. 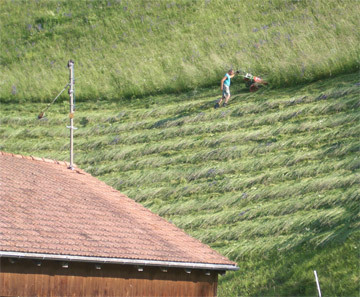 And whatever the reason driving the small scale industry, hay growing is serious business in places like Switzerland. In some areas it seemed that every possible scrap of land was used for growing it. Hay fields would go right up to the porch steps of a series of houses in a residential area, to the edge of the steeply banked train tracks, and would fill in odd little corners around commercial buildings. It had the look of a precious crop grown on precious land and yet it seemed like anything but that. Hauling in the well-fluffed & dried hay. We often didn't see many cows in a given area, but we knew that they are out there somewhere because of the obsessive hay production activities. We usually only saw them grazing outside at the higher elevations and assumed they were neatly tucked away indoors elsewhere. Aside from the traditional occupations in the mountainous regions, another factor of life in these steep mountains and their valleys is the acoustics. We didn't heard any nostalgic yodeling echoing through the valleys but all the other sounds reverberated loud and long. And as we climbed up the wall of some valleys, it seemed that there was little that we saw that we didn't first hear. The packs of motorcycles going up and down the steep roads could be heard long before and after they were in sight. In one area it was locals making their own music with hours of uninterrupted target practice hidden in the forests. We were not able to determine if it was hunters or reservists honing their skills and making enough noise that we initially thought it was quarry blasting. 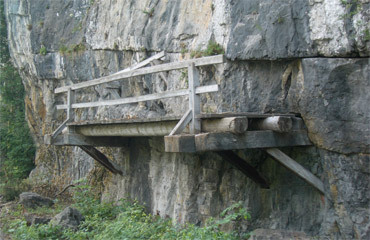 Of course, the small scale rock quarry and lumber operations added their distinctive bangs and whirs to the acoustic mix. And when hiking above the funicular at Ritom, we marveled at how far the screaming kids on a group outing could be heard. The acoustics of some of some of the valleys was astonishing and blissful were the times when the background noises were only the sounds of rushing water, the birds, and the muted clanking of cow bells. The screaming kids at the top of the funicular were one of a number of groups of Swiss kids we encountered. It appeared that another tradition of the region was a week of outdoor adventures before school let-out. As we slogged up our approach to San Gottardo pass, it looked as though a large group of preteen and teens must have gotten a bus ride part way up and were flying down the 10% grades on their bikes. None looked equipped to have done the ride up too. And we'd seen packs of kids on bikes cruising through Bellinzona with a couple of young adult chaperones. From what we could see, it looked like the emphasis was on having fun with no apparent curriculum insight, though each of those outings would have offered a wealth of opportunities for some educational sidelines. The huge bowl just off the top of Klausen Pass. Another novelty about life among these steep sloped mountains was the highly variable number of hours of daylight, especially of direct sun, even on clear days. The orientation of a valley community with the peaks and the time of the year could subtract hours of direct sun in both the morning and evening. In one small city, even in June, it was almost 10am before the sun made it over the peaks to warm the low elevation streets, 4 or more hours after sun rise. Other communities were aligned with the summer sun so that it became bright and warm just after sunrise. We hoped that some communities that looked ill-sited to us as summertime passersby were actually smartly positioned to capitalize on the warming of the winter sun. Klausen Pass north of Andermatt was the stunning pass that we assumed San Gottardo to the south would be. We hadn't planned on doing the almost 5,000' gain in 1 day, but given that our planned overnight town shown on the tourist info map at 2/3's of the way up was actually part way down the other side, we needed an immediate "Plan B". We'd gotten an early start and Bill was feeling the best he had in weeks, so when he discovered the map error a third of the way up, we decided to go on rather than lay-over--stopping at 10 am just seemed too early. Even with taking the extra 1/2 hour break just shy of the summit for Bill to cope with a bit of high altitude discomfort, we were pleased to have made it to the summit by a little after 3 pm. The road was dry but the snow was still deep at the pass. The sudden heat wave had made our departure temperature before 8:30 am in the high 70's--temperatures more taxing than we expected. But the sudden change in weather also meant that even at the summit, the temperatures were in the high 60's. The piles of snow along the road at the top served as a reminder of how quickly the weather changed and we didn't need to bundle up for the descent. We were treated to wonderful, wonderful views along the way to Klausen Pass, though the haze in the air didn't lend itself to many photos. "Only in Switzerland" Bill commented, could we pedal for 3 hours and still be looking down on the town where we paused at 10 am, as much of the climb up to the 6400' pass was switching backing up a single face. Part of what made the Klausen Pass route so dramatic was snaking along the mammoth valley with many almost-vertical walls constantly in view. The towering peaks around us were as much as 12,000' high. The town we saw for hours as we crept up the valley walls. The verticality in the region was startling. Even the next morning when we were cruising down another deep valley at about the 1800' level we found ourselves looking up at sheer faces towering almost another 6000' above us. We left the high mountains behind us and cruised along the river valleys for a few days getting poised for our next foray. Just as surprising as seeing the vertical faces while we were in the broader river valleys was seeing strawberry pickers sitting on 4-wheelers with a sun canopy. 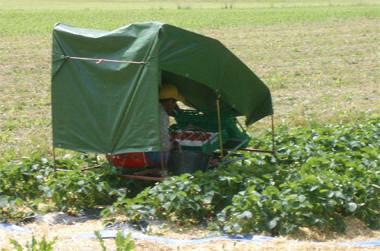 Bill figured the canopies were for shading the strawberries; I thought they were for the workers, but regardless it was a relief for both. And only in Switzerland did we pass by abandoned factories that looked groomed and well-kept. We have no idea what policies were behind this, but in 1 valley we passed a series of derelict textile factories that looked like any other building with fresh paint and neatly kept grounds. The only building we noticed with broken windows was an abandoned old hotel on the back streets of a small village. Like other light industry grounds, the bike routes and pedestrian paths were threaded through and along side these idle properties. The nifty cart the strawberry pickers sat in. I was amazed at how often in Switzerland that the boundaries between private and public spaces were blurred. We were often clueless as to where one homeowner's property ended and the next began or where the line was drawn between the land of an enterprise and that of the public green way. One of the practices that added to the blurring was of seeding most any bit of open space with pasture grasses. Occasionally rather than mowing, cows would be feeding directly from the land, perhaps right up to the edge of a car dealership's office building. The seamlessness of property ownership felt harmonious and yet a little disturbing to those of us accustomed to clear boundaries often punctuated by fences and hedges. It also made it harder to differentiate a poorly marked bike route from a private driveway. The serenity created by blurry boundaries outdoors was always fractured when we went indoors to shop. Switzerland is the only country on the the continent where we resort to our "Iceland" diet to cope with the high prices of food: a diet long on cabbage and short on seasonal favorites like strawberries and peaches. Broccoli, one of our stables, was routinely 5 times the price in the EU, whether fresh or frozen, as were the carrots. Bill longed for some chicken to up the protein in his diet but choked at the grocery store price of about $10/pound. (Even in the pricy Dolomites we bought a whole cooked chicken for less than $5). Like in Iceland, when it was available I was picking through the produce in Switzerland that was discounted before being discarded to pare our grocery bill. Bill & some motos at the top of Splügen Pass. Crossing over Splügen Pass continued to be on and off our itinerary and each debate about it brought back a flood of memories. And like with other revisited destinations, the closer we got to it, the more intense and voluminous the old memories became. I remembered our funky abode a couple of nights before the pass in 2001, low on the Italian side, where our shower stall was so narrow I couldn't even bend over to wash my feet. The next night, we stayed at the base of the climb and noticed another cyclotourist's bike in the hotel garage. Ullie, a retired German army drill sergeant with twinkling eyes, would adopt us for the next 48 hours and coax us up the pass in 1 day instead of the 2 we had planned. Ullie spoke little English and Bill had yet to revive his high school German, but we all communicated the best we could as we set out north towards Splügen Pass that year. As we tired under the strain of the huge effort of the relentlessly steep grades, Ullie rode a little ahead and arranged for a farmer and then a car touring couple to applaud our efforts from the roadside. Near the top, he treated us to hot tea and snacks at an isolated rustic inn. I wished that we had exchanged contact information--it would have been fun to tell Ullie we were still touring, that we were crossing Splügen a second time, though in the opposite direction. It was on the steep grades of Splügen that I learned how to select rest stops on the outside curves of banked switchbacks so as to restart my heavy bike effortlessly rather than doing exhausting "power starts". It was on Splügen I learned that the effort of climbing could still drench me in sweat even with snow on the surrounding ground and a light drizzle coming down. And it was on Splügen that our love affair with Alpine passes began, despite their sapping effect. The Swiss town of Splügen where we spent the night. Ullie wouldn't be pleased, but we broke the climb over Splügen this year into 2 days as we had intended in 2001. And this time we were going the easier way in the opposite direction, from the Swiss side to the Italian side. On our approach this year, we stayed in the same chalet-like hotel in the town of Splügen where we stopped for the night with Ullie after cresting the top of the pass. We and Ullie had camping gear strapped to our bikes but Bill and I were ready for the deep comfort of sleeping indoors with ample hot water nearby and Ullie took a room there also. The next morning we headed out with Ullie, parting company in the middle of the day. He was still our guide as we rolled up and down the hills towards Chur, pointing out an old Roman road area and instructing us to always stop to look back from where we have come. We however are experts at stopping, as others who have ridden with us know. We stop often to look back and around but Bill remembered his admonition as we pedaled through the area this year. 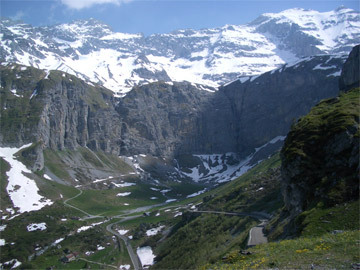 Our trip up the Swiss side of Splügen Pass was the delight we hoped it would be. Going in reverse on a route is a pleasant blend of recognizing the familiar and seeing things for the first time. Just the differences from seeing the sights in the morning or afternoon light changes one's impressions. A storm like the one that greeted us at the top in 2001 was pestering folks part way down on the Italian side but left us with only high clouds and a sharp wind at the summit this year. Bill is learning not to linger at the top and immediately dropped down about 500' to clear his altitude headache. I however needed to savor the moment and indulged in taking photos that weren't an option in the sleet 5 years ago. For me it was a chance to rewrite the ending to the story, the story that had ended in triumph but shivering in the cold. This time I could linger in the sun and claim my time at the top without the troublesome snow obscuring the landscape. 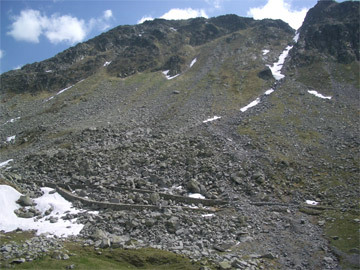 A Roman route with a small side branch near Splügen Pass. On our approach to Splügen the day before I had queried Bill about the "motos" or motorcycles. They were swarming us like we've learned to expect in the Dolomites, but I didn't remember then on Splügen. Our memories concurred, our trip up one side and down the other of Splügen Pass in 2001 had been a quiet, more solitary pursuit. But on the Swiss side this time there had been plenty of motos and cars and even a dozen cyclists. 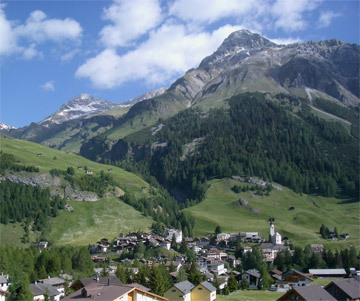 When we dropped down to Monte Splügen, the first settlement over the pass and down the slopes on the Italian side, we were stunned to be in a buzzing tourist town. Like on Dolomite summits, there were rows of moto's parked with their owners sitting on the sidewalks sipping beers. Cars were everywhere and there were now 2 hotels, a youth hostel and a number of restaurants and shops selling local wines and cheeses. It was like returning to a desert island to discover that Disneyland had set up there. There was even a new staffed tourist information booth--a disappearing service in other parts of Italy. We rode past the "refugio" or mountain retreat where Ullie had hosted us for hot drinks and snacks to warm us for the final ascent to the summit in 2001. It couldn't have been more different as then there were only our 3-some, the refugio hosts and 1 other couple anywhere in sight. Had we not been with Ullie, I would have stayed the night in one of their mountain hut rooms as I longed to extend my experience of being in the gray stillness of this mountain top. It wasn't a place I would want to spend much time, but it was so lifeless and bleak that it intrigued me. It seemed like a rare opportunity to dip into an extreme lifestyle for just a few hours and a part of me longed for the immersion experience. But our trip up the pass had been hosted by Ullie and so we continued on to the top with him. I was stunned to see that that time and place we experienced 5 years ago was gone forever. The gal at the tourist info booth said that the Italian valley town of Chiavenna had been working hard to promote tourism up the valley and on the mountain and they had succeeded. We estimated that there were in the range of a thousand people spread over about a 2 or 3 mile area devoid of trees. Cars were parked at odd angles on the fragile turf banks and on any available flat space. Hiking trails were marked in multiple directions; men were fishing; and families were picnicking at tables and on the slopes. This isolated mountain side where we had dug deep into our physical and emotional reserves for hours to ever so slowly propel ourselves up the steep grades in solitude had been discovered in a big way and transformed. We had to be grateful that we had climbed this steep pass from the more difficult Italian side when we did, as it wouldn't really be an option now. The traffic was so heavy that wobbling up on loaded bikes would be too dangerous, at least on a Sunday. Maybe the weekday traffic would be enough lower to make it safe. 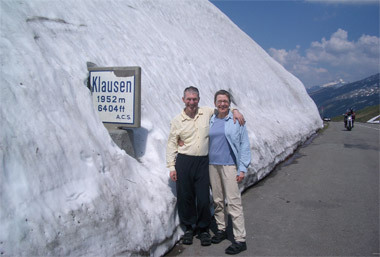 Going over Splügen Pass was a sentimental journey in its own right and in another way, as it signaled the end of our 2006 Switzerland tour. We bleed money while in Switzerland and complain about it daily, but at least it wasn't such a surprise this year. 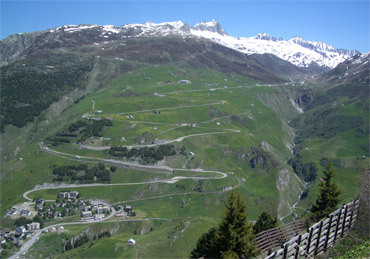 It's so expensive that we prefer not to stay long and yet we are becoming fond of its Alpine passes. We now have a couple of favorite passes and a couple of favorite places to stay. And like last year, we stumbled across the path of the Tour d'Swiss bike race and enjoyed watching some of it on TV at night for the footage of roads we too have biked (though not making our descents at 50 mph like they do). During each visit to the country, we struggle with the Swiss's odd spin on German and Italian and their reluctance to use the English that they all learn in school, all of which collude to make communicating frustratingly hard. And we are slowly learning to ignore their cold shoulder--it's just the way most of them are. Passing bikers don't make eye contact and don't return a hello and only a couple of Swiss will chat with us at all over the course of a several week visit. We were pleasantly surprised when a group of motorcyclists sipping beer turned and acknowledged us as we slowly pedaled by instead of looking through us, but then we noticed the Italian and not Swiss plates on their motos. Our sense of connection with Switzerland deepened this year with the coincidental learning of more of its history. 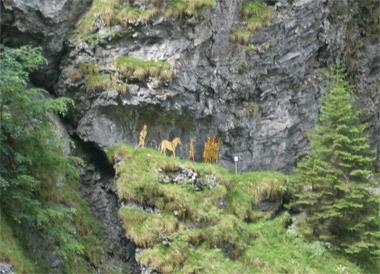 The small sign for the "Megalithic-Kultur im Schams" was too tempting, even on a climbing day to the town of Splügen. The tiny free and unstaffed museum up the hill from the tourist village of Andeer documented a megalithic culture in the area--a sophisticated culture that was before the Celts and the Romans trudged through. A reconstructed Middle Ages trade route along a lake. At the 2-roomed museum, we learned that there was evidence for humans in the area from 8000 bce, shortly after the ice receded from the region. By 4770 bce the folks living here were constructing elaborate astronomical calendars--at least elaborate for those in-the-know. To us they were just oddly assembled shallow holes in the surfaces of rocks, but to the more imaginative, sticks could be placed in the holes and lines drawn to predict the solstices and other important astronomical rhythms. The technical German descriptions strained Bill's vocabulary, but the scholarly supporting documents left no doubt as to the conviction of the scientists interpreting the wriggles and holes. 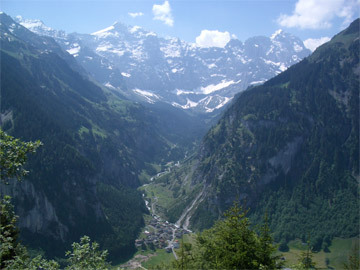 In later millennia, the history of Switzerland became the history of the local people in a central location trying to fend off aggressive neighboring powers that wanted control of the passes that connected France and Germany with Italy, including the trade routes used by the Celts and the Romans. And back at the beginning of this year's Swiss tour--in Bellinzona on the lake--we pondered the 3 Middle Ages forts designed to tax merchants and control access to the 3 nearby Alps passes. San Gottardo Pass had a tiny museum which deepened our understanding of the use of pack animals to move cargo through the difficult mountains from the Middle Ages into the 20th century. And seeing the reconstructed elevated roadway along the Swiss lake Walensee using discovered postholes, added a more vivid understanding of what those trade routes were really like. Our trip up Splügen again exposed us to an old Roman roadway through the deep ravines, reinforcing that the technology of traversing the mountains didn't change much over almost 2 thousand years. So despite the aggravations, we will be back. We will be back to Switzerland to learn a little more history, to savor the drama of the Alpine passes, and enjoy the predictability of the groomed and orderly villages. We are in Nuremberg in southern Germany. The middle of August has us slogging through rain and avoiding flooding rivers rather that melting under the summer sun as we had expected. Bill is spending hours almost every night crafting our route to take in the best of the museums while maximizing our time on the numerous bike routes. Germany is an easy place for us to be with its very pro-bike culture and Bill's constantly improving language skills. And just to keep things interesting, we'll hop a train to make an overnight side trip to Berlin to see a temporary Egyptian exhibit of underwater archeology finds.